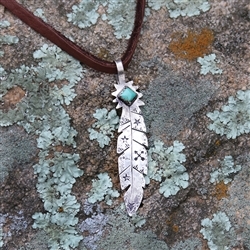 This is a custom Sterling Silver feather necklace. It is adorned with Southwestern stamping and turquoise. The pendant measures 2" tall and comes on a leather strap.